The table of experts was held at Webster University in March. 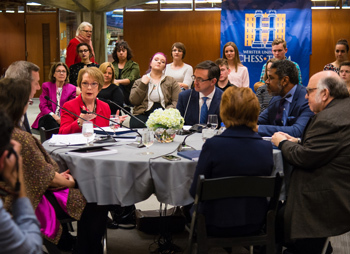 An experts roundtable hosted at Webster University last month is featured in this week's edition of the St. Louis Business Journal, with arts leaders from across the region discussing the growth and economic impact of the arts on the region. Panelists included Marie-Helene Bernard, president and CEO of St. Louis Symphony Orchestra; Gene Dobbs Bradford, president and CEO of Jazz St. Louis; Timothy O'Leary, general director of Opera Theatre Saint Louis; Dennis Reagan, president and CEO of The Muny; Webster University President Beth Stroble; Steven Woolf, artistic director of Repertory Theatre St. Louis. O’Leary observed the difference between New York, where it was a struggle to get local corporate leaders to invest in local arts institutions, and St. Louis, where he “noticed immediately a totally different tone with the corporate community. ... There’s a spirit of support for the arts and culture in St. Louis that is not about pitting our organizations in competition with one another but really about collaboration and how can we rise together. And that’s been my experience for a decade in St. Louis." Stroble added, “I think we set that tone as well as the corporate community. Each one of our arts organizations partners with one another, which gives us more artistic opportunity than we would have by ourselves. And that’s part of what our donors understand and support." The discussion highlights partnerships among arts and other institutions, the role of arts in unifying fragmented communities, and how the arts have grown -- and draw more attendees than sporting events -- in St. Louis, among many other topics. Read an edited transcript of the entire panel online here or find it in this week's edition of the Business Journal. A guest commentary by Tony Award winner Terry Schnuck in the same issue of the Business Journal highlighted how "arts are good for business," noting many Webster alumni who've made their mark. "St. Louis arts and cultural resources contribute to the standing of St. Louis on the world stage, are a “draw” to our region, and, importantly, serve as an economic engine of its own. In 2016, St. Louis’ 160 arts and cultural institutions welcomed nearly 12 million people (surpassing that of all St. Louis professional sports teams combined) generating nearly $230 million in related revenue and almost $58 million in state and local taxes. "Behind these numbers are some incredible talents that the city has produced and who are giving unforgettable performances in every genre, reaching into our souls while others are sharing their technical, management and design talent across the nation. 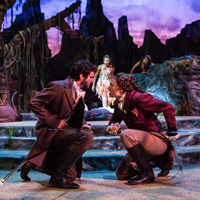 "Much of this incredible talent has come out of the Webster University Conservatory of Theatre Arts," Schnuck writes, noting that "the Conservatory is widely recognized as a catalyst for success." President Stroble is interviewed in the Post-Dispatch's "Advancing St. Louis" series, which highlights local leaders of small businesses and large corporations that are impacting the St. Louis region. Why are topics of diversity and inclusion important for Webster? "I think back to how Webster started. We were founded by women in 1915 before women could even vote. Today, we have students that come here from all over the world and have campuses with professors and students in Europe, Asia and Africa. We also serve students on 20 different military bases. "For 26 years in a row, Webster has been cited as the number one university in the country for awarding master’s degrees to African-Americans. Our history and record say that we care about diversity. "The only way to move forward and be better at understanding and valuing differences is to engage in learning more about each other. If universities and cities work together hand and glove, we’ll make faster progress. To be true partners, we need to struggle through the topics on which St. Louis needs to move forward — topics like diversity and inclusion." 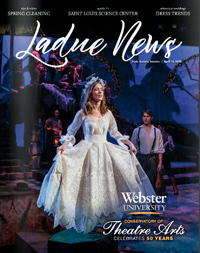 The cover of the Ladue News this week features the Conservatory 50th anniversary. 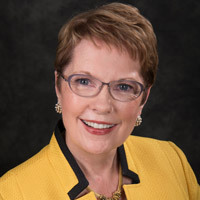 Dottie Englis, professor and chair of the Conservatory, is quoted throughout. The article says "the Conservatory treasures a connection between its faculty and students – past, present and future. After all, they have proven to be masters of the stage, year in and year out. Webster will celebrate the 50th anniverary of the Conservatory with a series of events the weekend of April 20-22.